This table shows modifier categories with 12 or more modifiers for each category including degree, time, contrast, unity, manner, cause-and-effect, and place words. 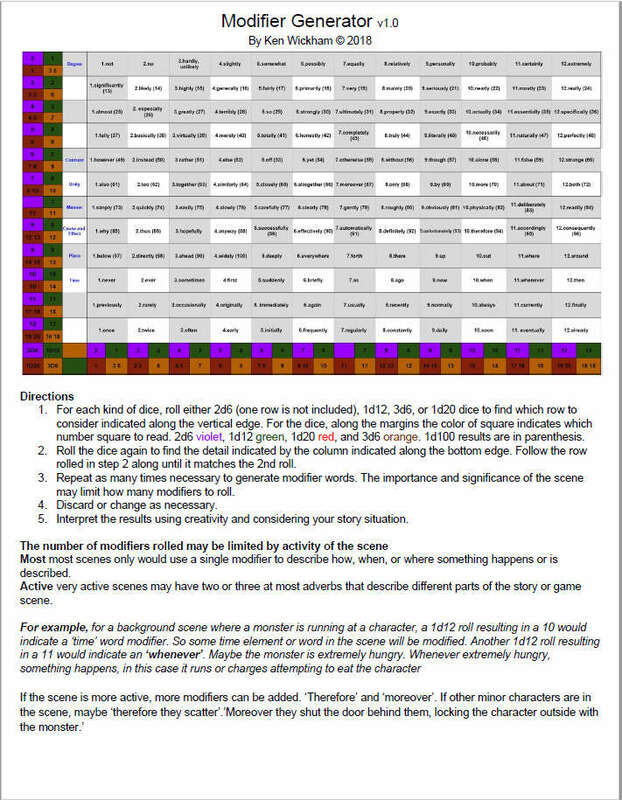 This is a flexible modifier generator that is meant to aid or take the place of a Gamemaster (GM) for modifying descriptions or actions of characters, creatures, objects, places, and things. They modify how, when, or why something is described or does something. Included are a total 144 listed modifiers in the entire table. They may be used in writing, solo gaming, or to aid a GM in showing character mood descriptions. It is intended to be a paid upgrade to work with all the other generators including the Fact Generator, Description Generator, Mood-Emotion Generator, Sound Generator, Character Generator, Motivation Generator, Plot Generator, Knowledge Generator, Plot Generator, Body Language Generator, Solo Engine or Dialogue Engine or be used separate to add one or more modifier to story or game settings. This title was added to our catalog on August 18, 2018.